NEW YORK (AP) — Rockies third baseman Nolan Arenado has been suspended five games for charging the mound after Luis Perdomo threw a pitch behind his back, inciting a benches-clearing brawl during Wednesday's game against the San Diego Padres. "Five games is a lot of games," Arenado said before Friday night's game. "I just defended myself." Arenado and Parra appealed their suspensions, allowing them to play for Colorado against the Washington Nationals on Friday night. The Padres said Perdomo would not appeal. Baumann was optioned to Triple-A on Thursday, so he'll serve his suspension the next time he's up with the big league club. "It's hard not to react a certain way when you know someone's trying to do something on purpose. It is what it is," Arenado said. "Obviously, five games — you don't want to fight. That's not why we're playing this game. But 96 (mph) at you on purpose, you get frustrated." 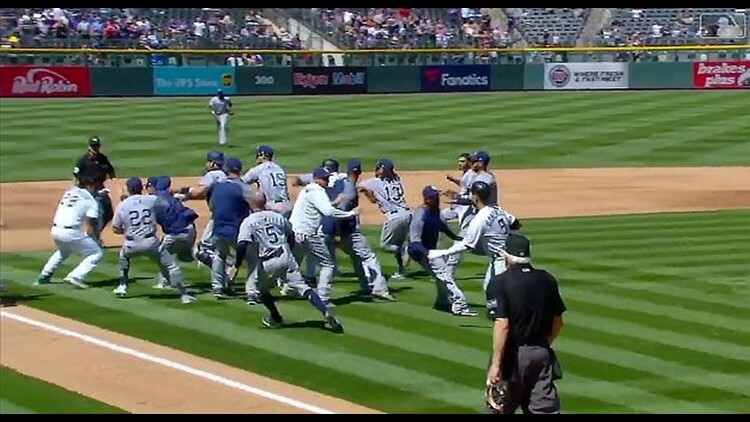 The brawl came during a tense series that included three batters being hit by pitches before the benches-clearing incident. San Diego's Manuel Margot was hit first and ended up on the disabled list.